As the one national holiday that is celebrated in more countries around the world than any other, St. Patrick’s Day is the day when everyone wants to be Irish. 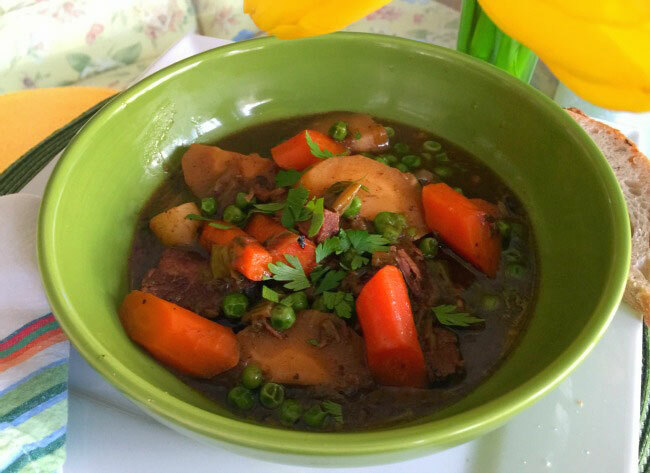 Don your green, and honor St. Patrick with this delicious slow-cooked lamb stew. Growing up, we had cows, chickens, pigs and goats, but we never raised sheep. Since most of our meat came from the stock we raised, lamb was not on our menu. I was a teenager before I tasted a lamb chop, and it was love at first bite. With it more readily available from our local farmers and markets these days, lamb frequently is on our dinner plan. Since early spring in Arkansas can still be quite chilly and rainy, this Slow-Cooked Irish Lamb Stew is especially welcome. 1. In a large zip seal bag, season flour with salt, pepper and garlic powder. 2. Dredge lamb cubes in seasoned flour, shaking to remove excess flour. 3. Heat 3 tablespoons canola oil in a large Dutch oven over medium heat. Working in batches, brown lamb on all sides, removing to a paper-towel lined plate until all cubes are brown. Do not crowd the pan while browning. Add additional oil 1 tablespoon at a time as needed. 4. After all of the meat has browned, scrape the browned bits from the bottom of the pot; add leeks and onion and sauté until softened. 5. Add garlic to onion and sauté 1-2 minutes. 6. Add the lamb back to the Dutch oven. Add cloves, nutmeg, Worcestershire sauce, bay leaf, rosemary, thyme leaves, Guinness, bouillon and water. 7. Cover and cook the lamb mixture in a 200-250 degree F oven for 6 hours or until the lamb is tender and the broth is thickened. 8. Add parsnips and carrots and cook 1 hour or until slightly tender. Add potatoes and cook an additional 45 minutes – 1 hour. Check cooking liquid. 9. Twenty minutes before serving, stir in green peas. 10. Remove rosemary stem and bay leaf. Adjust seasonings to taste. 11. Garnish with chopped parsley at serving. If desired, the stew may be prepared in a slow cooker. I prefer the additional depth of flavor that slow cooking in a Dutch oven provides. Cooking times in a slow cooker set on low are virtually the same as for the Dutch oven at 200 degrees. Variation: Omit the potatoes and serve the stew over egg noodles, long-grain rice, mashed potatoes or Irish colcannon. Arkansas Women Blogger member and co-administrator Debbie Arnold pontificates and eats at Dining With Debbie. She and her Hubby split their time between Central and Northwest Arkansas. 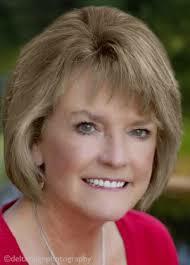 She loves to cook, develop recipes and have play dates with her two perfect grands. Mostly, she has play dates with the Perfect Ones.